Find the best bots here! 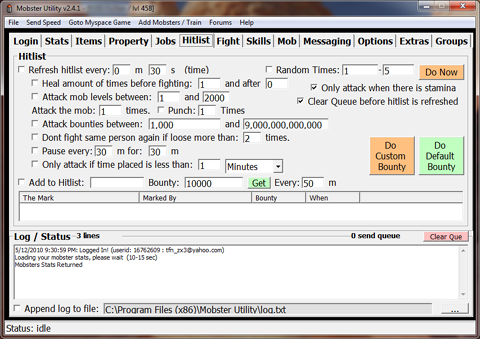 Do you need a bot to keep your mobster active? How about a bot to return energy or ride the hitlist? We can help.. Not only can you get a bot for free from here but we will tell you the scoop on what bots are working and what bots are getting mobsters in trouble with TOS.. Here's a bot that I have seen in action.. it's by fxscripts and cost 20.00 for a one year subscription.. It works well and you use any of these at your own risk..
How bots work! Here's are some videos of mobster bots in action..
Did you make a bot? Have you heard of the bot that's going around that can drain a mobster account all day? For real.. There is a bot that can actually take all your energy, all your health, and all your stamina away! The person who created it is on my site sometimes.. Hes stingy with it right now but might be releasing it soon.. But for now here are some bots that work well on mobsters on both facebook and myspace..